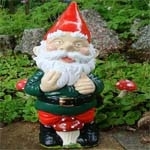 Our Classic Garden Ornaments - Gnomes, our traditional range that has been made by hand, for over 70yrs at Pixieland. They make a perfect addition to your garden and also a wonderful unique gift. Gnomes are a garden family favourite and with lots of gnome options to collect from fishing gnomes, DIY gnomes, relaxing and sleeping gnomes, to our overall cheeky gnomes. We sell commission gnomes on request and our best sellers are our Wedding Couple Gnomes. We have our very own Super Hero Gnomes. Pixieland is one of the last places that make and paint gnomes by hand and out of concrete, the traditional way.